“Baile Juan” cried the singer as the perfectly sculpted male dancer began a gentle tapping of his Cuban heels on the hardwood stage. The guitarist strummed a lilting Spanish rhythm accompanied by the palmitas (hand claps) of Sandra, Juan’s flame-red dressed, dance partner. Mesmerised the audience watched as Juan gradually sped into a frenzy of impossibly fast taps and sensual hand movements. In Seville, at the world’s only dance museum devoted to flamenco, four top performers treated the audience to a captivating performance. Having witnessed Sandra’s elaborate dance steps, exquisite scarf play and passionate facial expressions, the contrasting stillness of the perfectly formed body with the frantic footwork was spellbinding. Run by the legendary Cristina Hoyos, the museum offers a full interactive experience and epitomises the passion, variety and history of Seville, the most vibrant of Spanish cities. An open class at 18:30 invites everybody to have a go, and the daily 19:30 performance seduces visitors in the most intimate of flamenco venues, with the theatre holding just about 50 people. Just as Flamenco has mixed roots, the sublime Alcazar (Muslim fortress), covering 20 hectares, pays homage to Sevillano history. Originally a tenth century Spanish fort, the building has undergone many reincarnations. In the 11th century it was a Muslim palace, then in 1248 the Christians captured Seville and established a monarch’s palace. Beautiful door motifs typifying Moorish design are edged with Syrian writing, not reciting the Quran, but the book of Genesis. It was at the Palace that Christopher Columbus was awarded funding in 1492. The Battle of Granada was instigated from the throne room, the winning of which resulted in Spanish unification. The Castillan Grammar Book citing the rules and regulations for the national language was written here. 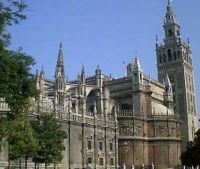 Franco gave the building to the people of Seville. No less significant, and said to be the largest Gothic cathedral in the world, Seville’s most imposing edifice is 126m long and 83m wide. Originally a Visigoth Basilica, in 1198 it became a mosque. The mosque was then adapted to Christian needs in 1248 when it was used as a church, and it was only in the 1400s that it was pulled down, and construction of the immense Cathedral began. The original mosque’s minaret still stands. Stepping from the cathedral’s sunny orange tree patio, into the darkness of the interior, eyes take a moment to adjust, and when they do religious opulence is unveiled. Silver candelabras up to a metre and half high. At the centre resides the largest altar piece in the world. Two hundred and fifty carved figures made of gold, silver and delicate paintwork form 43 tableaux recounting the principal tales of the bible. Resting peacefully to the right of the altar Christopher Columbus’ coffin sits atop the shoulders of four heralds representing the kingdoms of Castile, León, Aragón, and Navarre. Once again in the sunlight wandering around the Barrio Santa Cruz, previously the Jewish quarter, it’s easy to sink into the favourite local past times of eating, drinking and staying up late. Narrow streets and small squares are filled with tavernas, bodegas and bars serving a bewildering array of dishes. For superb Andalucian fare, squeeze into Restaurant Enrique Becerra, one of Seville’s most popular eateries. The man himself gives a warm welcome taking time to explain his menu. Lamb with dates and honey, braised oxtail, pork served with pate sauce, and a mix of home-made croquettes provide a superb introduction to Andalucian fare. 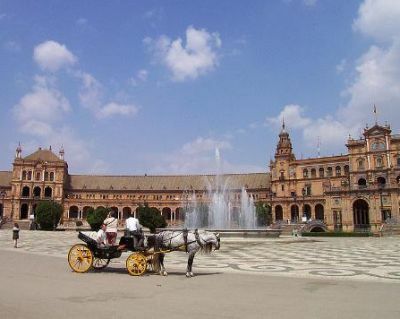 Seville city accommodation is mixed, ranging from basic hostels to the 5-star luxury of the Hotel Alfonso XIII. The environs also offer great options and for an authentic Sevillano country mansion head to Cortijo El Esparragal. Take a horse ride on an Andalucian pure bred, discover the realities of bull fighting and enjoy rustic food such as braised pigs cheeks. However if rural isn’t your thing then head for Hotel Casa Romana. Set in La Alameda an area of trendy bars, and chic shops, Romana offers 26 rooms and elegant Romanesque decor, in a former 18th century inn. 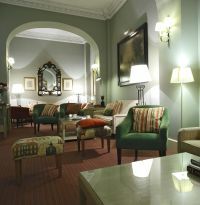 Rooms are available from €150. 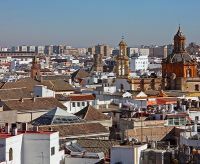 With the eateries, bars and Soho feel to the left, and the wondrous buildings, history and culture to the right this has to be one of the best spots from which to explore the magnificent, fiery and festive Seville. AERBT flew from Heathrow with Vueling on Jezebel the Jade Jagger interior designed aircraft, in itself an interesting experience. Vueling calls itself a "new generation airline", born out of low cost carrier routes, and is the only carrier of its kind operating to and from Heathrow, the world’s busiest international airport. 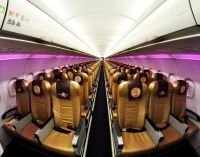 It has co-branded two of its A320s with MTV, covering the exteriors with street-inspired art. Inside, the in-flight entertainment systems have been stocked with MTV shows – including "True Life" and "Super Sweet 16" plus audio playlists. Its latest innovation is to offer gift vouchers that can be exchanged for tickets on any of its routes.